Generally speaking I am, as a photographer, a realist. I attempt to catch what is there, in all its glory. Sometimes it is fun, however, to mess around with an image in software just to see where it goes. The result is not strictly speaking real, but sometimes you have to stretch the truth to make it true to the experience, at least in the telling, or the portrayal in this case. The Rhodora was just coming into bloom at Saco Heath in what is becoming, my girls tell me, our traditional family outing on Memorial Day. Many plants were vibrant, but there is still more to come. 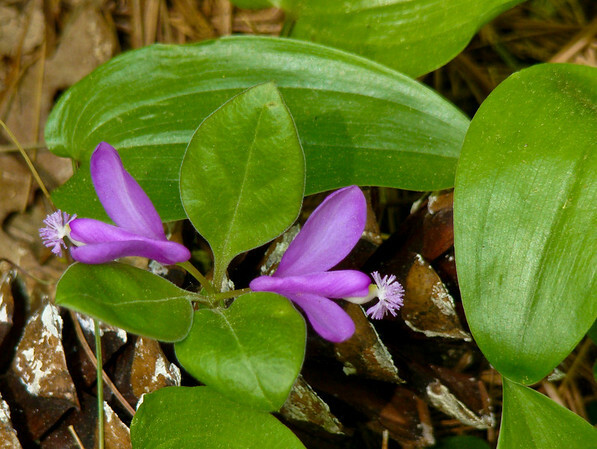 Interesting, since last Memorial Day the Rhodora at Saco Heath was all gone by when we visited. The base image here is, as usual, taken with the Sony DSC H50, in this case, at full tele, 465mm equivalent. F4.5 @ 1/500th @ ISO 100. Programed Auto. I started out in Lightroom with my usual processing. Added Clarity and Vibrance, sharpen, black point to the right. This is what it looks like. 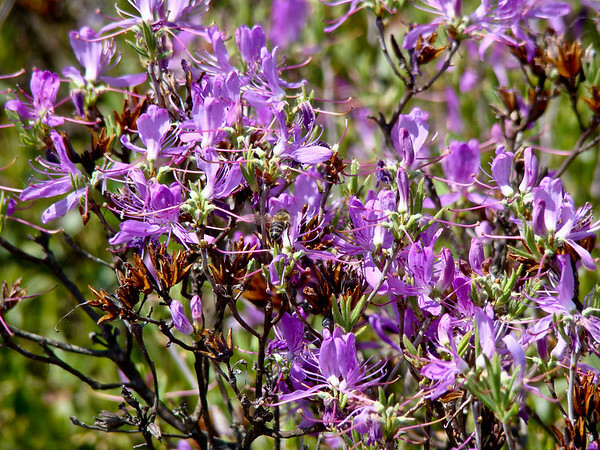 I am totally happy with this image and it stands alone as a real picture of what the massed Rhodora blooms looked like that day…but it does not, maybe, fully catch the impact of the day. In Lightroom I made a Virtual Copy of the image. This creates a new copy that I can re-edit, but does not duplicate the original file on the hard-drive. It simply creates a second set of instructions for processing the original when exported from Lightroom. I opened the VC in the develop module. I have tried this before with other images so I knew what I was about to do. Clarity slider all the way to to left, adding what amounts to negative clarity, and softening the whole image. Negative clarity also produces interesting halo effects at strong color boundaries. I boosted the Vibrance even more, and added a small amount of saturation. And undid the sharpening. Hay presto. 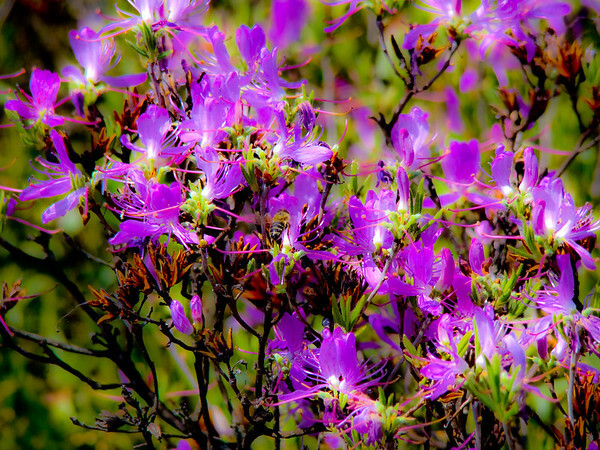 In seconds I had an impressionistic version of the Rhodora image. Does it do a better job of conveying the effect of the massed Rhodora blooms? Maybe. I like it anyway. How about you? Taken at the macro range of the tel end of the zoom on the H50 at 465mm equivalent, and from a low angle using the tip-out LCD: the background is nicely soft and full of bokeh. Using the far reaches of the zoom did, however, push the ISO up to 400 but the H50 managed a detailed image anyway. Not bad for a tiny sensor. Sony DSC H50 at 465mm equivalent. F4.5 @ 1/125 @ ISO 400. Programed auto. Cropped in Lightroom for composition. Just my usual added Clarity and Vibrance, and sharpen. 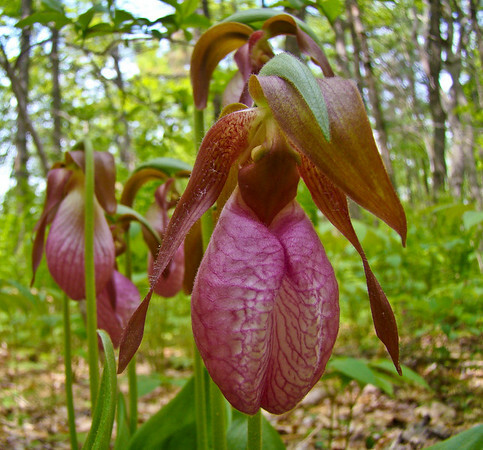 So, okay, I thought (and maybe you thought) that I was done with Lady Slippers. I got more and better shots of Lady Slippers this year than ever before because there were more and better Lady Slippers. Then, last Saturday, I took a walk down to my local warbler hole for some birding and video (hopefully), and went off on a side trail looking for Rhodora in bloom, and there they were…thousands of Lady Slippers! Lady Slippers in the early sun, sneaking in across the forest floor. 1000’s sounds like an exaggeration, I know, but it is not. Within a 1/4 mile I am totally confident that a count of Lady Slippers visible from the trail would have totaled over 1000. I have never seen anything remotely like it. 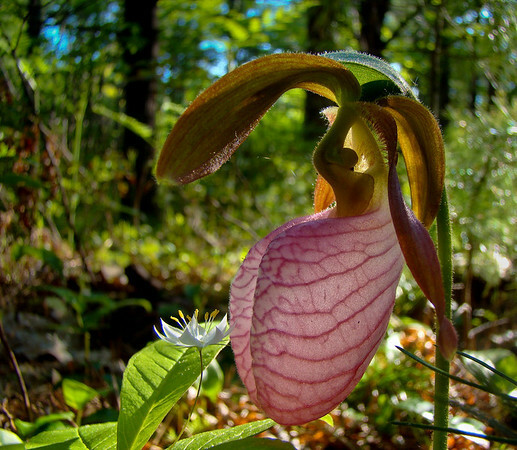 When the light is behind a Lady Slipper, two things happen. Light gets caught in the fine hairs that cover the whole plant, and the inflated petal just lights up as though it was filled with, well, light! Catching the effect is difficult but not impossible. Maybe best is when you can get the flower against a dark background where the sun isn’t hitting, but a well out-of-focus forest isn’t all bad. Bokeh. Lots of potential for Bokeh. In this shot, I found the added bonus of the Star Flower nestled up against the Lady Slipper. Sony DSC H50 at full wide and macro (taken just about touching the LS). F3.5 @ 1/60th @ ISO 100. Programed auto. Slight Recovery in Lightroom, along with added Clarity and Vibrance and Sharpen. Blackpoint to the right. Cropped for composition. Because the background was a bit too distracting, I used the Local Adjustments brush to paint on a mask over the background, and then decreased Clarity and Contrast. 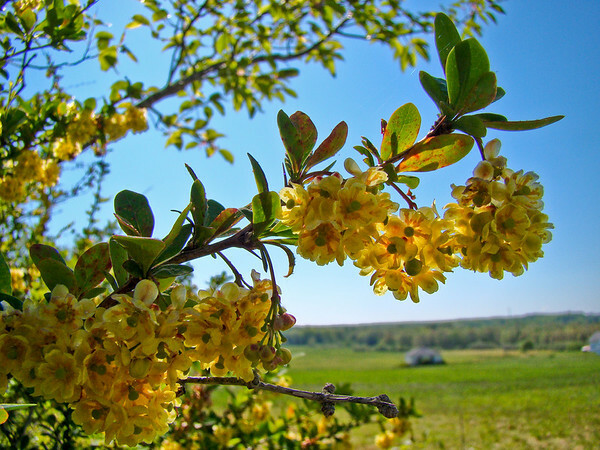 Evidently I have never been to Laudholm Farms (Wells National Estuarine Research Center) when the Barberry was in bloom, or perhaps, as it seems, it is simply a bumper year for wildflowers and flowering shurbs of all kinds. 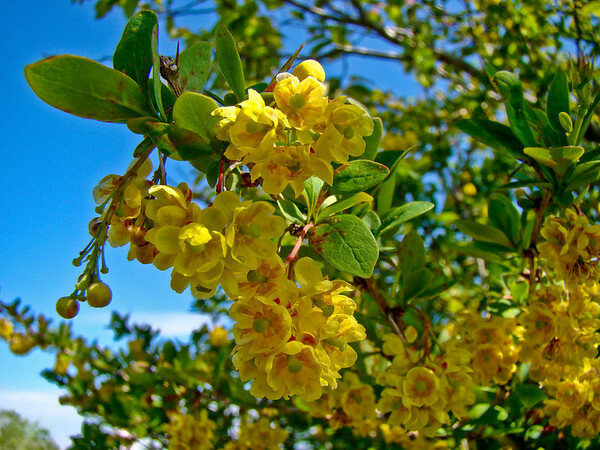 I certainly remember nothing like the Barberry show this year. 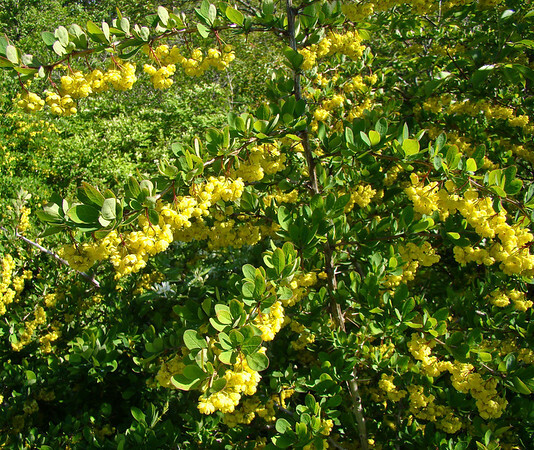 Barberry produces pendent clusters of yellow flowers, like hanging bells of yellow bells, along the length of the sharp barbed whips. For this shot, I framed a whip against the sky and fields of the farm. Sony DSC H50 at full wide. F5.6 @ 1/640th @ ISO 100. Programed auto. Because I wanted to get the foreground detail and maintain realistic exposure of the background, I had to let the camera underexpose the flowers. In Lightroom, I used the Fill Light tool to bring them back up, remembering that they were not in full sun and need to be darker. Added Clarity, and very slight added Vibrance (vibrance can easily over do the yellows). Sharpen. And here, for context is a shot of the underside of a laden whip. And one showing the larger structure of the plant. This is a somewhat unconventional composition but the subject suggest it. Normally you would want the subject facing into the image, not pushing its way out (not necessarily terms we apply to flowers, but in this case they are apt). And, again, in this case, we violate the rule because it adds a dynamic tension that makes the image (I think) more interesting. 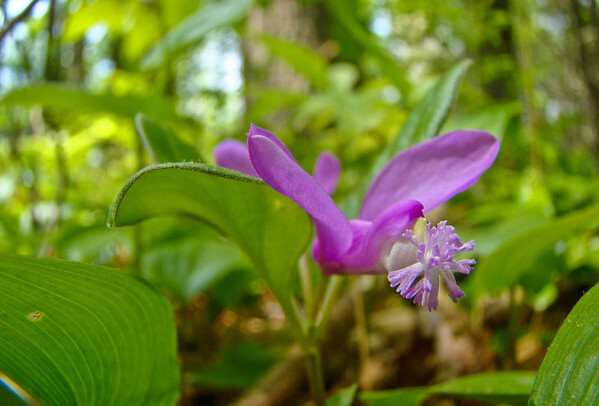 This flower is only about 1 inch in diameter and grows about that from the ground, so I am right down on the forest floor for this shot, with the camera resting among the ferns and other wildflowers (carefully so as not to crush anything). Sony DSC H50 at full wide and macro. F4.0 @ 1/125th @ ISO 100. Programed auto. In Lightroom, just my usual added Clarity and Vibrance and sharpen. Blackpoint slid to the right slightly to intensify the color. And the more traditional view. It is the season for these close up views, low to the ground where suddenly everything is in flower. 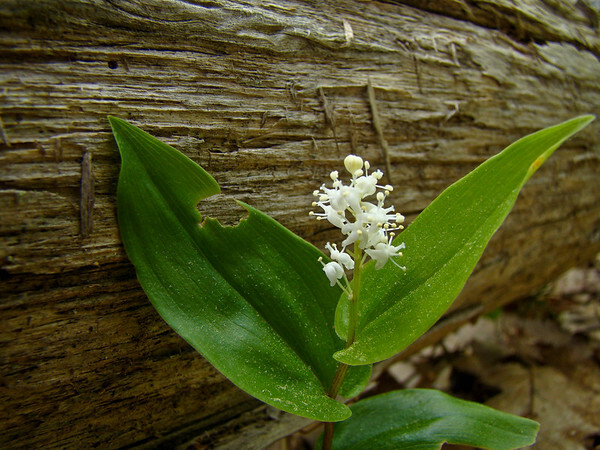 Canada May Flower. It was all over, but it is small and tends be hard to photograph because it is hard to make it pop out from the confused background of the forest floor. Here the log made a nice backdrop. Sony DSC H50 at full wide and macro. F4.0 @ 1/60th @ ISO 100. Programed Auto. -.7 EV exposure compensation to preserve detail in the white blooms. In Lightroom, some Recovery for the blooms, added Clarity and Vibrance, sharpen. 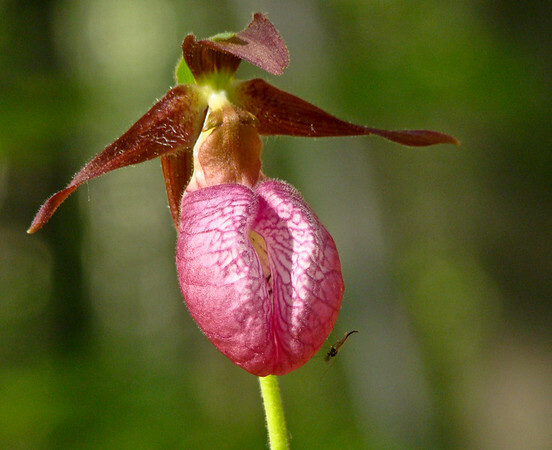 Another Lady Slipper (or two). On this one you can see the hairs on the inflated petal. Taken from 1/4 inch or so with the macro on the H50. Cropped slightly from the left for composition. Added Vibrance and Clarity, sharpened.